Special Summon “Rose Tokens” (Plant/DARK/Level 2/ATK 800/DEF 800) in Defense Position to either field, up to the combined number of cards in the Field Zones and Field Spells in the GYs. If this card is in your GY: You can target 1 “Black Rose Dragon”, or 1 Plant monster, in your Monster Zone; banish it, and if you do, place this card on the bottom of the Deck. During the next Standby Phase, return that banished monster to the field. You can only use this effect of “Blooming of the Darkest Rose” once per turn. Blooming of the Darkest Rose may be more useful in the grave than used on the field. Rose Tokens equal to Field Spells in the grave and on field combined could get you a few tokens, though it may take some time to amass a few field spells. Giving your opponent tokens may not be the best idea unless against Sky Strikers. Use the tokens for tribute fodder, Synchro or Link summoning, but its grave effect may be more useful. Omega-like effect from banishing BotDR to save your Black Rose Dragon or Plant monster in your Main Monster Zone, then bring it back next Standby Phase is much more of an applicable effect. Protection during either turn is great, and if you are able to get at least one token off of this card you will break even, which should be the minimum aim of this card. Sometimes a card comes along and you read it a few times to make sure you got it right. 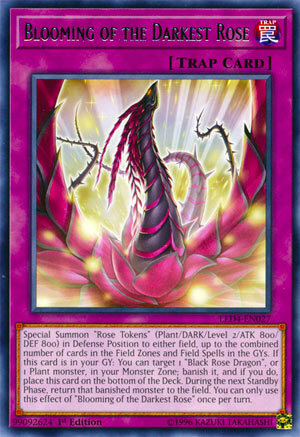 Blooming of the Darkest Rose is a free Normal Trap Card that Special Summons Rose Tokens in def mode to either side of the field up to the number of Field Spell Cards in the Field Zones or in the graveyards. Obviously not a turn one card, but it can certainly spam the board for Links, OTKs, or blockers. It’s also searchable and this effect is not once per turn. So far so good. Now the second effect triggers in the grave and is definitely once per turn. From the grave, you can target a Black Rose Dragon or any Plant monster in your monster zone for banishment. If successful, Blooming of the Darkest Rose goes to the bottom of your deck and the targeted banished monster returns to the field during the next next standby phase. If I have this right, you can Synchro Summon Black Rose Dragon and then activate this to nuke the field but have your BRD come back next standby phase. That’s awesome so long as nothing misses any timing. Even if that’s not the case, you can still use this to dodge undesirable effects, or to just make room for new monsters. Run at least 2 because Blooming of the Darkest Rose is searchable offense and defense. We are now looking at one of the cards Red Rose Dragon can search as mentioned yesterday, Blooming of the Darkest Rose. Blooming of the Darkest Rose is a Normal Trap that when activated summons Rose Tokens (Plant/DARK/Level 2/ATK 800/DEF 800) to either side of the field in Defense Position up to the combined number of cards in the Field Zones and Field Spells in the GYs. Hmmmm, those Tokens seem familiar. Up to meaning that if there are more than 5, you can just summon 5 tokens yourself while your opponent doesn’t get any, which is important so you can start Link Summoning some monsters to open up Extra Deck Zones in Main Monster Zones. This might of been better as a Quick-Play Spell, but I guess it being a Trap keeps it more balanced considering how good Scapegoat is and how easily you can get Field Spells on the field and in the GY probably. I can imagine this summoning at least 2 or 3 Tokens on average, it’ll at least summon 1 but that isn’t an optimal time to use it. If this card is in your GY, you can target 1 Black Rose Dragon or 1 Plant monster in your Monster Zone and banish it and if you do then this card will return to the bottom of the deck and during the next Standby Phase, the monster you banished returns to the field. This can move your monster out of the way if your board is getting clogged up and you need room for combos or if one of your monsters has something like Phantom Knights’ Fog Blade or something else making the monster almost useless. It going to the bottom of the deck is fine considering Red Rose Dragon does search for it if need be. The effect to return to the bottom of the deck is a hard once per turn because I guess they are fine with Token spam. Blooming of the Darkest Rose is a solid card and worth experimenting with in Link decks with several Field Spells, and it is much more balanced than Scapegoat when it comes to Link Spam. Art: 4/5 Art like this looks like it’d be on a card that summons Black Rose Dragon, which I guess the banish part does the job there. Blooming makes sense since this card summons tokens. Blooming of the Darkest Rose…which I tried not to go into too terrible much detail yesterday knowing we were looking at it today. Cards that depend on Field Magic cards aren’t typically a great strategy, and as a general rule, most Decks that have a Field Magic (or even more than one these days) usually can function just fine without having to run said cards. You’re pretty much only using this for the Tokens, the removal/re-summon aspect is nice enough, you’re sort of applying the release ability of Stardust Dragon to Black Rose Dragon (or whatever Monster you ended up removing, for the sake of argument, I’m saying BRD). The Tokens aren’t entirely useless, they can be Tributed, or they can be used for Burn, the Plant Deck does like to cycle through and (re)Summon its Monsters. I think you’ve got to help yourself some with this, the Tokens can be helpful in Link Summons, but I don’t see you just throwing this into your Deck and reaping benefits of it just because you did. But, having said that, it’s a bit of a card for a thinking player, and I appreciate intelligence, so that makes me appreciate this card (to a degree). It might surprise you. Art: 4.5/5 Black Rose and the light behind is very nice, though Black Rose is much brighter than normal here…perhaps a sunset? I like it a lot, however.